Look at this beautiful Puffy Heart bracelet. It measures 7 1/2 inches long and features 16 charms. 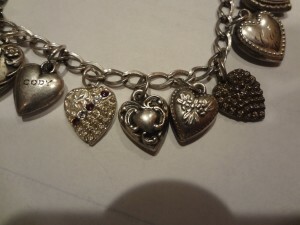 The larger charms are stamped STERLING with personalizations: Minnie, Cody, BLW, A, Cad, AT, ABC, Leo, Wilma, PAT, and JM. The largest heart charm measures 7/16″ X 1/2″. There are also gems in 3 of the hearts. This would be a sweet bracelet with small repousse designs. Click here to view this puffy heart charm.